Max Alexander bounded back last night at the Blue Horizon in a fight that was probably the best of his career thus far. 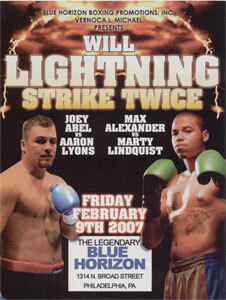 Alexander pitched a near shutout over eight rounds in his main event rematch against Minnesota's Marty Lindquist. Alexander seemed to be out to convince all of us, and himself, that his first fight with Lindquist was a fluke. alive and well and perhaps even improved. The normally battle-adverse pitty-pat prospect from Camden, NJ really threw some leather last night. The results were thrilling and hopefully indicates an style-adjustment that will be welcomed by local boxing fans. As he waited for the opening bell, Lindquist looked like a sprinter in the blocks, coiled and ready to repeat his quick work. But when the fight started, it was a bull fight. Lindquist pressed the action and swung for the fences, but most of the time Alexander wasn't in range by the time Marty's bombs arrived. This was nothing new. Max can slip and slide with the best of them. The difference in this bout was that Alexander made Lindquist pay when he missed. Fighting mostly in a southpaw stance, Alexander fired hard shots that found their mark. In round two Alexander dropped Lindquist with a hard left. Lindquist got up but there was no relief in sight. In round three, Alexander's heavy body work (another new tactic) turned Lindquist's sides pink from his armpits to the top of his trunks. Then a thudding body shot dropped Lindquist in his own corner. Marty got up again, showing the hostile Philly crowd how tough he was, but you could tell by the look on his face that Marty knew this wasn't his night. He didn't look worried, or frightened, or hurt. No this genuine tough guy just smiled, knowing that there was plenty more beating left to take. In round five, Lindquist went down again and took a heavy battering in the sixth. But he wasn't too hurt to chase after Anita, the ring card girl, before the seventh. Just as round seven wound down, Alexander knocked Lindquist down again (that's a total of four). The last round saw Alexander frost the cake with his lefts and rights. At the bell, Marty seemed completely impressed with Max. So were the rest of us. All three judges scored it 79-69 for Alexander. I had it a shutout at 80-68. The win raised Alexander's record to 13-0-1 (3 KO). Lindquist dropped to 12-5 (9 KO). Both also have one No Decision. The semi-windup was a wild affair between "Minnesota Ice" Joey Abell and his opponent twice replaced, Cornelius Ellis. Abell won it when Ellis didn't answer the bell for round four. Southpaw Abell had Ellis down near the end of round one and knocked him out of the ring in round two. In the third, Ellis went out of the ring again, but the ref called it a "no knockdown". It was all Abell which delighted his big Philly fan base. Included in the crowd of about 950 were Joey's Mom, Grandfather, and numerous other family members who came to the fight from Minnesota and other distant locales. Abell is expected to face originally scheduled opponent Aaron Lyons at the Next Blue Horizon show on April 6th. The undercard included six additional bouts. Ricardo Medina, Mexico, defeated Lenny DeVictoria, Philly, by split decision in a six round lightweight fight. Jr. welterweight, Elad Shmouel, Israel, won a four-round unanimous decision over Ryan Belasco, Wilmington. The crowd booed when Gee Edward Clumer, Philadelphia, got the unanimous decision in six over Michigan's Daniel Hicks in a middleweight bout. Phoenixville featherweight, Jules Blackwell TKO'd Earnest Scott, Virginia, at 1:05 of round two. Israeli Ran Nakash took a unanimous decision over Robert Murray, Mississippi, in their four-round heavyweight fight. It was Murray's pro debut. In the show-opener, Philly's Bryheim Douglas settled for a four-round draw with Jason Jordan, Ohio, in a welterweight clash.